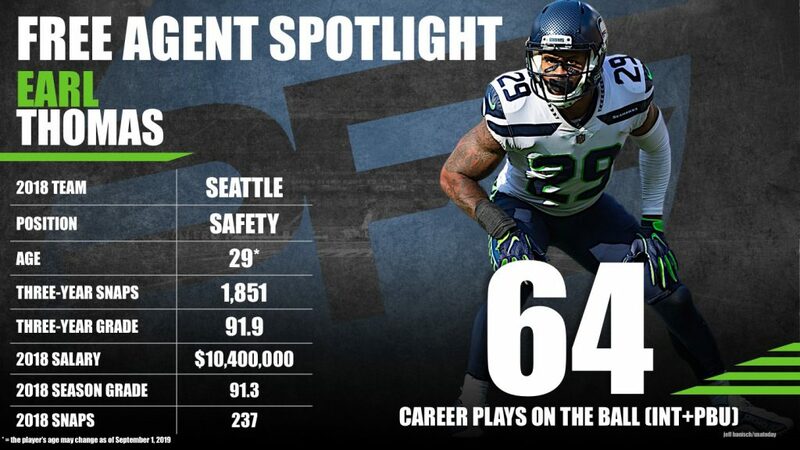 Earl Thomas’ nine-year career with the Seattle Seahawks may not have ended well, but his contributions on the field were among the best in the league at the safety position when healthy. He earned 84.0-plus overall grades in each of his final six seasons with the ‘Hawks and will look to continue such dominance with whichever team signs him in free agency. Pro Football Focus will be running through 50-plus pending/soon-to-be free agents between January 7, 2019 and March 8, 2019 to offer detailed analysis of the top players bound for new contracts and (possibly) new teams in 2019. We want to house all of the important grades, advanced stats and key analysis for each player so you know exactly what your team is getting in free agency. The team that overlooks Thomas’ age and health concerns will get a game-changer at the safety position well worth the price tag. He adds too much value to a defense when healthy for all 32 teams to not want to swing the bat on the soon-to-be 10-year veteran with a Hall of Fame resume. Subscribe to Pro Football Focus’ ELITE subscription to research Earl Thomas’ grades, advanced stats, snaps and more in Premium Stats 2.0.